Even with an endless parade of spineless Republicans (supposedly the conservative party! ), this month’s selection for the Hall of Lame was a shoo-in. With your tail tucked between your legs, take your bow Senator Jeff Flake. Arizona’s junior senator is not useless for opposing President Trump on key issues, with trade policy being one. Genuine concern and disagreement is fair game. Jeff Flake is a dud for selling out our president and his supporters to peddle a book and win cheap praise from the liberal media. 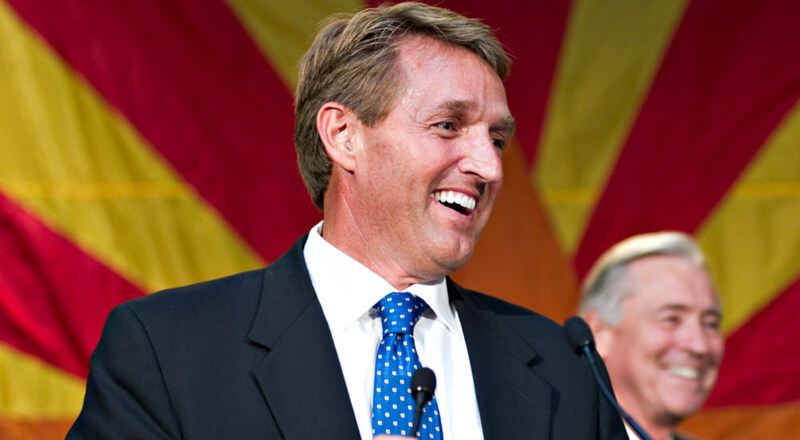 Flake’s tome is entitled Conscience of a Conservative, the same title used by another Arizona senator almost sixty years ago. Barry Goldwater, by contrast, sparked the conservative revolution with his words, courageously presenting arguments both new and controversial without pandering or selling out anyone. Michael Gerson of The Washington Post calls Flake’s book “the single largest act of political bravery of the Trump era.” Are you kidding me? Criticizing or abandoning Trump, even in Republican circles, is about as brave as saying, “Good morning” in an elevator. Far-left columnist Leonard Pitts praises Flake’s book for condemning conservatives’ role in a culture of “vicious dehumanization.” For his part, Flake expresses his deep opposition to Trump’s (very limited and targeted) so-called Muslim Travel Ban. In a show of solidarity, the senator went and visited a mosque. The phrase that pays? Self-serving. Flake,a Mormon, writes that, “When we say ‘No Muslims’ or ‘No Mexicans,’ we may as well say ‘No Mormons.’ Because it is no different.” Given that Mormons have been mostly peaceful and law-abiding and have not violated out southern border, it certainly is different. Our president’s focus is protecting the safety of our citizens through adherence to the law. Flake’s focus is winning a gold star from The Washington Post. Simply Flake has fallen for the idea that the right is responsible for the lack of civility in political discourse. He has publicly criticized the calls of , “Lock her up!” (meaning Hillary Clinton) at Trump rallies, yet seems to have no problem with endless Russia-Russia investigations, stalling the president’s – and the people’s- agenda. He has nurtured the lie that it is the conservative base of his party that should tone down the rhetoric. He recently chided Donald Trump’s hounding of President Obama over his birth certificate, forgetting that it was Hillary’s 2008 campaign that (pardon the pun) gave birth to that issue. But that’s a small point. The larger question is this: if Donald Trump were a gentleman, would the left be any less intent on his personal destruction and derailing his agenda? Furthermore, if Trump had been nice, could he have been elected? Conservative voters are tired of nice, spineless Republicans. Mitt Romney ran as a gentleman, as did John MCain, and to what end (speaking of the turncoat McCain, is there something in the water in Arizona that turns Republicans into RINO’s?)? Americans of all stripes are tired of cautious, calculated leaders who are afraid, for instance, so utter the words ‘radical Islam.’ America wanted a fighter, not a condescending treatise on civility. They wanted Donald Trump. Besides, it is the American left that wrote the book on incivility. Forget book, they’ve composed a whole library! And forget incivility, try hatred! The left’s revenge quest will end only when Barron Trump’s grandchildren bow their heads in shame. We can’t say the words ‘border wall’ without being called bigots and nationalists, but Flake will barely lift a finger to condemn the toxic, false rhetoric emanating from the left since last November. Flake gripes about birtherism, but has he condemned the lie that candidate Trump mocked a disabled reporter? What, one wonders, does Flake think of the endless assassination fantasies making the rounds? Where was Flake when opponents of Obama-care were labeled racists (including the false claim that the n-word was shouted on the Capitol steps)? Due to the limits of space, I have to stop here. In conclusion, Flake is just another one of many Republicans who values the good opinion of the media over his own base. Defending traditional-minded Americans will never win your tripe the honor of being called, “moral courage” (Leonard Pitts). Jeff Flake is not leading a chorus, he is simply chanting the mantra of elite opinion. For a real man of courage, skip Flake’s book and read the original Conscience of a Conservative by Barry Goldwater. Note: When Congressman Steve Scalise was critically wounded earlier this summer, Senator Flake was there immediately to offer him aid and comfort. For that, I salute Senator Flake.